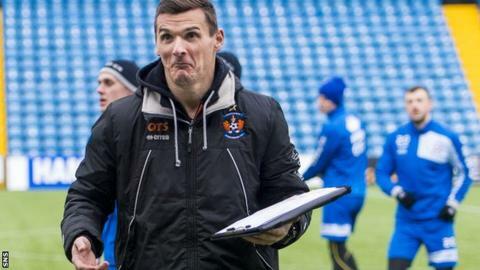 Lee McCulloch admits it will be "surreal" leading a team to Ibrox after being placed in caretaker charge for Kilmarnock's Scottish Cup tie. The former Rangers captain took the reins this week after the resignation of Gary Locke. "Who would have thought that?" he said about Saturday's game. "It's pretty surreal, isn't it? "I'm looking forward to going back to be honest. I had eight great years there, no regrets." While Kilmarnock sit second bottom of the Scottish Premiership, their hosts are flying high at the top of the Championship. McCulloch, who moved to Rugby Park as player-coach after being released by Rangers in the summer, admits that his task is to restore belief after Locke's departure. "It's been hard," said McCulloch. "Last week was the lowest I've ever seen the club, the players. "The dressing room was really low, so this week has been all about trying to get the confidence back and get a bit of enjoyment back into training. "It was a sad place all round on the Monday, but it's up to the player himself to find that inner belief to get his confidence back and want to go the extra yard in training to do that." Billy Davies and Ally McCoist, two managers who McCulloch has played under, have been linked with the Kilmarnock job. "It is difficult circumstances," said McCulloch. "I spoke to Gary on Saturday night and obviously he was a little bit down, but he just said 'get on with it'. He is going to move on as well. "It's just about getting on with training, going into Saturday and we will see what happens next week. "Everybody at the club has got to take responsibility and that's what we have spoken about this week, taking responsibility and trying to get a winning formula back." Rangers, now managed by Mark Warburton, are a much-changed team from the one McCulloch left following their play-off defeat by Motherwell in May. "They are on a roll just now, they are passing the ball really well, they are organised, they have a great manager, a great tactician," added McCulloch. "He knows the game inside out, so it's going to be tough. "But we need to go there and believe and hopefully we can just put on a better show."